YOUR KID DESERVES A breakthrough in confidence. THIS IS SO MUCH MORE THAN LESSONS. Kids perform their all-original music with their band. Hop on the mic and strum along with easy-to-learn chords. 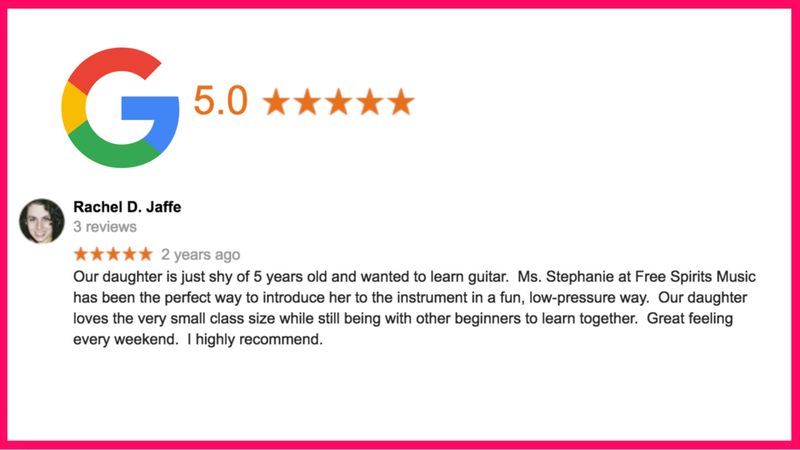 Learn songs quickly like "Twinkle Twinkle" and "We Will Rock You" by putting stickers on the fretboard. Extinguish shyness, self-doubt, and stage fright by chanting empowering affirmations every week. Let Shyness Disappear Write songs (not-so-secretly anymore!) with a band and fall in love with being a rockstar. Discover A Lifetime Of Confidence Learn how to sing & play an instrument -- starting from nothing, to being on a stage, in 4 months. Know What Your Kids Are Learning Parents receive a weekly wrap up via email after every single class with at-home practice guides. Culminates In A Magical & Exclusive Capstone Event Celebrate our original songs and inner power at two family-friendly events throughout the year. SATURDAYS @ 10:15 - 11 A.M. Classes meet weekly at Complete Music Studios. You can usually catch a superstar rehearsing here for shows at Barclays Center and BAM. CLASSES START FEBRUARY 2. REGISTER NOW. Any allergies or medical conditions we should know about? We will happily offer a full refund up to 3 weeks prior to the first day of class for every semester. After that, Free Spirits Music classes are a non-refundable investment. We trust you to make a wise and thoughtful decision. 6 kids per class, max. Write your big group song for the recording session! Confidence chant “Be Yourself” I’m strong mighty and confident / But I can be cool kind and shy / I have the power to turn the world upside down / And nothing is gonna stop me, nothing is gonna stop me"
** Optional Add-On: Begin Your Private Lessons & Record Your Own Song! 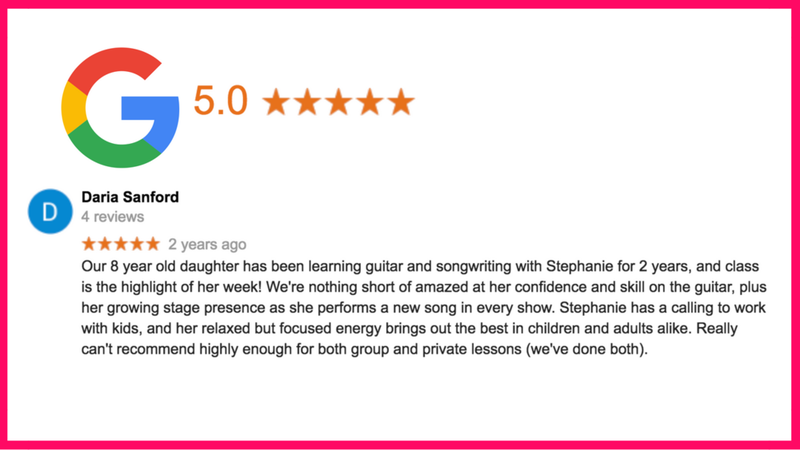 You'll receive a custom private lesson schedule before classes start, and you approve all the scheduled dates and times. These 5 lessons are not included in tuition (additional $500). You’ll get an email in 15 minutes with calendar invites for the entire semester. Figure out if you need the makeup classes included with tuition..
Plan to drop your child off at class and go relax with a latte across the street! After every class, you’ll receive a Weekly Wrap Up the next day explaining what we did in class and how you can practice at home. Hey there, I'm Stephanie. I am a singer-songwriter and the Founder of Free Spirits Music, and my mission is that every child gets that she is a powerful artist and her voice matters. I cannot wait to meet you. Before I created Free Spirits Music I taught at a half-dozen music schools. The staff was underpaid and overworked. Classes were a beat up church or the basement of a school, with little to no aesthetic or equipment. Teachers did their best to squeak a couple chords out of the kids, but they had limited training on how to comfort, encourage, or nourish the profundities of their students' thoughts. At Free Spirits Music, I've changed all that. Classes are taught in high-performing studios built for rockstars. We play rock shows with packed crowds overflowing with excitement. Every moment is action-packed with technique, power, and intimate support. Over the past 6 years, I've supported over 1200 songwriters in dealing with self-doubt and being creative every day. I also get to write songs with children with cancer, and I have the warm support of Yoko Ono on that project. I'm an introduction leader at Landmark Worldwide and an Advanced ThetaHealing practitioner. Hello! I'm Caroline. I'm a singer, guitarist, and songwriter. I'm a big believer in the power of self-expression, and it is my joy to help others find their voices through song. from LAST YEAR'S Mini Singer-Songwriters! "He's learned to read music, play his guitar, explain chords, play live, teach his younger brother to play and become a happy, music-crazed member of society, appreciating everything from Motley Crue to Steely Dan. Whatever happens in that studio room allows my son to express himself and feel confident. The patience and infectiousness of the teachers clearly rubs off. I love that there's no condescension and no limits. Plus, the songs are actually pretty catchy. I would absolutely, totally, unequivocally recommend Free Spirits Music. I would say that watching my kid perform is an absolute gift, but watching Stephanie mouthing all the words for every performance in encouragement onstage beside them is what dedication and encouragement really looks like. Please find a way to bottle this. Confidence onstage and creating with others transcends the music studio to touch every aspect of young people's' lives. I wish I had a class like this when I was young." "Oh gosh, I just love it. Seeing these young people being supported to create from their hearts and share it with the world is so amazing and truly such a wonderful gift. 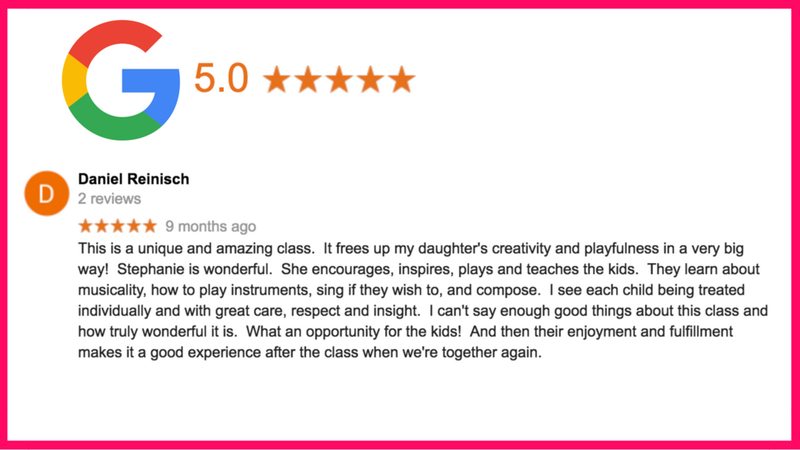 So grateful to Free Spirits for the vision and creation of such a great program that supports the individual's voice and grateful as a parent to be able to offer it to Aliyah. This year Aliyah had much more connection with the audience and was much less nervous. More confident overall. At times I noticed that she projected more than past years too. I also loved the cohesiveness and support she and her band members shared." "Willow would not let me hear or see the song in advance so I had no idea that it would move me to tears. It was AMAZING. The words, the melody, your harmony - I felt the song. She was so nervous and I saw the moment she looked at you and got her confidence to belt out HER SONG! I appreciate you and all you do for these children. The space you give them to create is life changing. I listened to Willow's other performances and it is clear how much she has developed and grown under your direction." 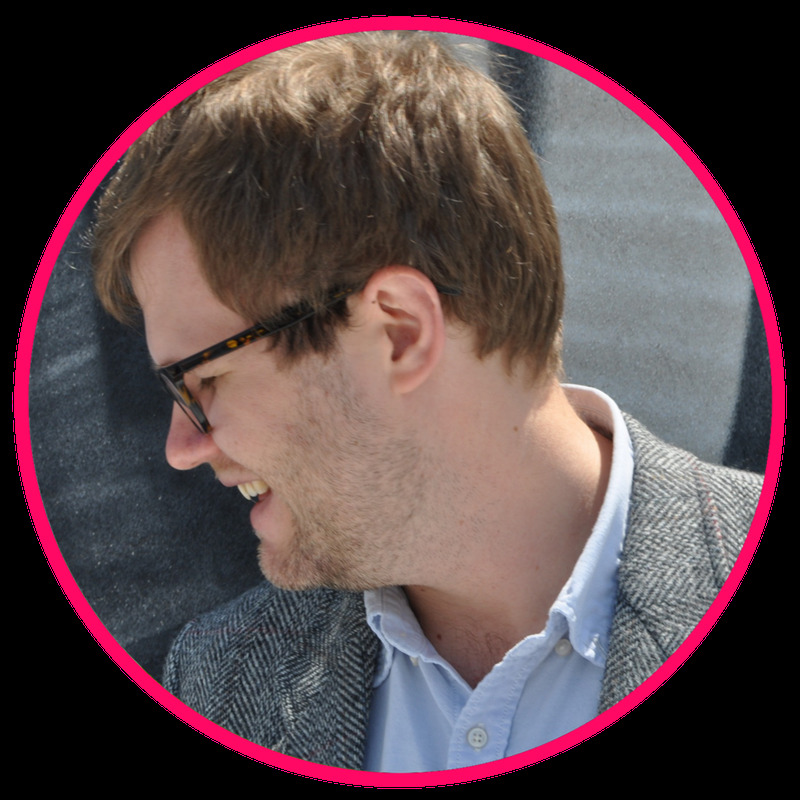 "Since joining Free Spirits Music, Roberto has had more comfort with singing and inventiveness. I really liked the colored dots for notes. I recommend Free Spirits Music because the focus is on love of music and confidence and not perfect playing." 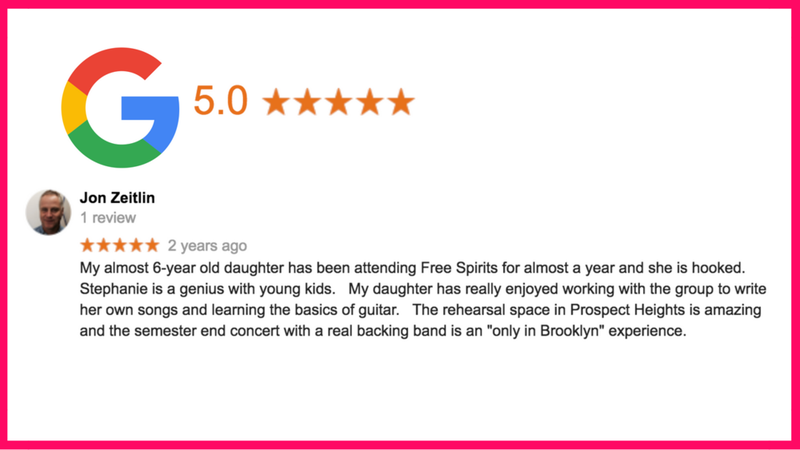 "I absolutely recommend Free Spirits Music. The best was the lack of pressure to be perfect at anything but instead just try. This worked for us!" "I noticed a big difference in confidence level from the Fall to the Spring. I really like the wrap up emails and the audio/video to help her practice her songs at home. And I love the stickers for the guitar! Genius!" Our classes are meticulously priced based on how many students we have. It's what keeps 6 kids/class and 2 teachers/class! Half Year Tuition: We will happily offer a full refund up to 3 weeks prior to the first day of class. After that, your tuition is a non-refundable investment. You may transfer it to another child at no additional cost. We trust you to make a wise and thoughtful decision. The not-so-fine-print is that we work in a “semester” structure. If you reserve a spot for the full year, and then decide for whatever reason you don’t want to participate in the Spring Semester, we will give you the option to cancel your subscription. You’ll have that option until 3.5 weeks before the first class of the spring semester. After that, these programs are a non-refundable investment. It’s how we are able to offer small class sizes with many teachers. We trust you make a wise decision. It depends. Healthy snacks are given to students in any classes longer than 60 minutes. Please make sure your child is well fed before class - it will keep away the grumpies. You should always do what's best for your financial budget! We offer a high-value, high-quality learning experience. Our end-of-semester performance is superior to many music programs in NYC. All that being said, scholarships and payment plans are available! Because keeping a small class size is important to us, we cannot offer pro-rated prices for missed classes. The tuition from every child is carefully calculated so that we can afford finest studios, concert halls, equipment, and staff. However, we offer a makeup class every semester, and we'd love to have you there. + Can you explain how the copyright will work? Personal songs will be in 100% copyright to the child who wrote it, even if they had support from our staff in writing it. Right now, group songs will be copyright to Free Spirits Music, simply because we’re not able to manage the copyrights of 6 different people - it’s complex. The children will also be taught a step-by step walkthrough of how to copyright their song and why intellectual property is important. It varies every year. 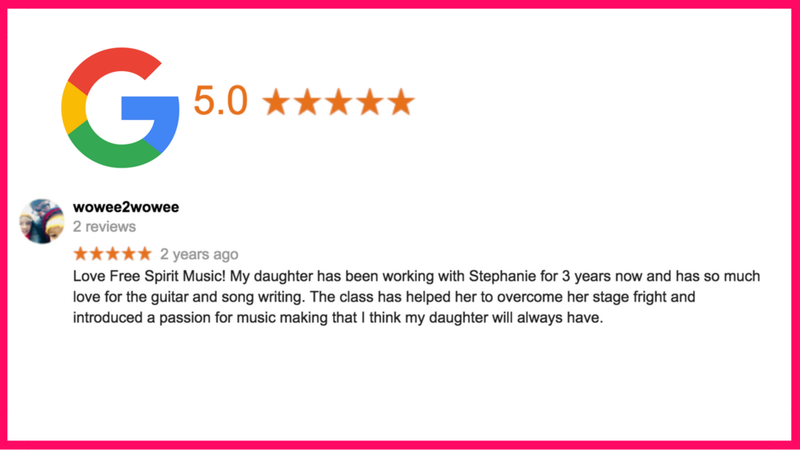 We really champion girls in music, and our classes show it! In the past, classes have been about 60% girls and 40% boys. Yes! Every year we offer 4 partial scholarships and 1 full scholarship to families who otherwise wouldn't be able to participate in our programs. If you'd like to apply for a scholarship, please fill out the form here. Scholarship recipients will be notified in early September 2018. + How much one-on-one time does my child get with their teacher? There are 2 teachers in every class, and classes are VERY personalized and custom-created to each child's individual needs. Private lessons are the perfect addition to these custom classes. 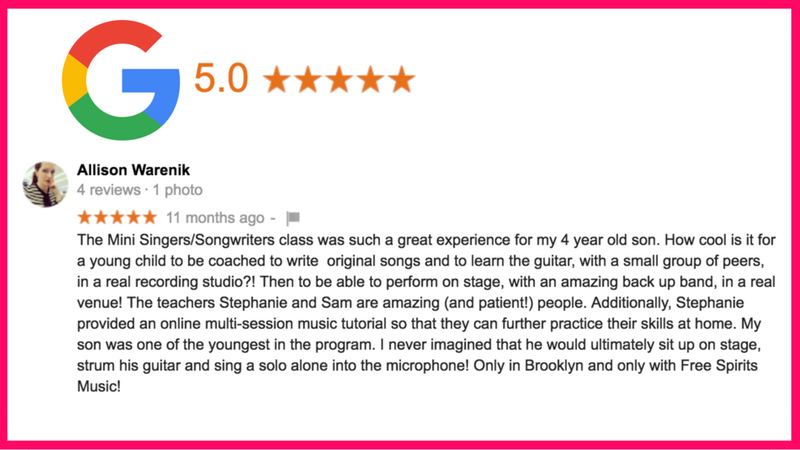 Superstar Songwriters have lessons included in their tuition, and Mini Singer Songwriters can purchase a 5-pack. Lessons happen the same day as class, either before or after class time. + Is the Free Spirits Music community really all that and a bag of chips? It really is! 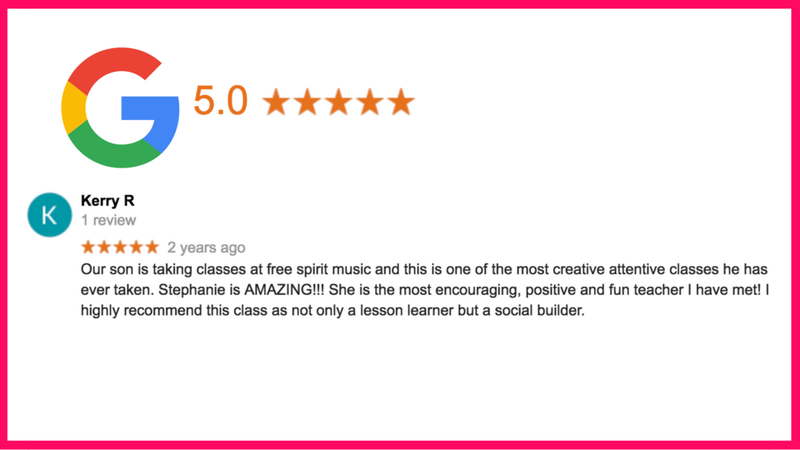 The Free Spirits Music community is one of the most vibrant, supportive communities you can possibly join. It’s a safe place for your chld to explore their confidence blocks with no arrogance or judgemental people. Everyone is rooting for their success. It's so special. to our VIP List to get $50 off the 2018-2019 school year.